temperature and pressure measurement into a single instrument. Vortex shedding flowmeters provide consistent process fluid flow rate measurements across a wide range of applications. These flowmeters measure the volumetric flow rate of steam, gas, and low viscosity liquids, boasting both versatility and dependability when used in conjunction with process control systems. Vortex shedding refers to the phenomenon wherein flowing gas or liquid forms vortices around a solid obstruction placed in the flow path. The measurement technology returns an indication of the process fluid velocity, which can then be used with other data to calculate volumetric or mass flow. Vortex technology is well suited for many applications involving cryogenic liquids, hydrocarbons, air, and industrial gases. 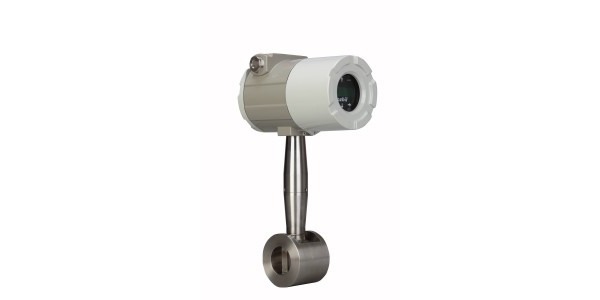 Vortex flow measurement does require contact between portions of the measurement instrument and the process media, so these flowmeters are commonly fashioned from a range of corrosion resistant materials. Compatability between the instrument construction materials and process media must be considered for every application. The process of measuring the flow involves both the flowmeter and the ability for other instrumentation to measure the vortices themselves in order to calculate velocity. Ultrasonic sensors have become popular tools for measuring vortices. Applications involving flow measurement of high viscosity fluids are not well suited for vortex technology because extremely viscous fluids do not behave in the same manner as lower viscosity fluids when their flow path is obstructed. Splitting higher viscosity fluids into concordant vertices is extremely difficult due to the internal friction present in highly viscous liquids. Additionally, in order to split these process liquids, the piping through which the process material flows must be straight, and disturbance or vibration in the pipe may impact the measurement. A vortex flowmeter will be in a fixed installation. This stationary element, operating without electrodes, can be advantageous for flow measurement in chemical applications utilizing low viscosity fluids. The vortex shedding flowmeter is widely used for the measurement of steam flow. The high pressure and elevated temperature of steam, along with the variation that exists in most steam systems, have little negative impact on the operation of a vortex flowmeter. Vortex shedding flowmeters are volumetrically based in terms of measurement, but their output can be combined with other fluid measurements and data to calculate mass flow. A product variant commonly available will combine the vortex flow measurement with temperature and pressure compensation, delivering three process measurements from a single installed device. Whatever your flow measurement challenge, share it with process measurement specialists and leverage your own knowledge and experience with their product application expertise.